Over 90% of mineral resources remain underexplored throughout Central Asia. Many local companies use outdated technologies developed over 30-40 years ago. Development of a world class mining industry requires considerable levels of FDI. In current resource constrained times and low commodity prices, Central Asian states compete with other jurisdictions to attract that FDI. Investors require a stable and predictable investment climate, open and transparent governance and access to reliable geo-data. The introduction of the new mining code in Kazakhstan – Central Asia’s powerhouse, will help address both of these issues. MINEX Central Asia will continue offering its platform to develop stronger business engagement bringing the international expertise, technologies and finance to Central Asia’s mining projects. For delegate, exhibitor, sponsor and presentation opportunities please contact us at admin@minexforum.com. will be held in November 2016, place and dates to be confirmed. The ongoing economic crisis has led to a decline in manufacturing in the European Union to 15.1% of GDP. To increase the share of manufacturing in the economy to 20% by 2020, the European Commission is introducing urgent policies and initiatives for a European Industrial Renaissance. This will make a huge impact on the development of mining and renewal of the mineral resources which are crucial for a strong EU industrial base as an essential building block of ƒthe EU’s growth and competitiveness. Over the last decade MINEX Forum provided vibrant platform for industry-wide exchange of innovative technologies and investment in mining and exploration in Eurasia. The first MINEX Europe Forum was successfully organised in Vienna in November 2015, delegates from over 25 countries attended the Forum and agreed that it should become an annual event showcasing European mining industry’s developments, promoting technological advancements and investment opportunities. If you are interested in supporting MINEX Europe 2016, we will be happy to hear your views and proposals. Mines and Money London 2016 – Europe’s leading mining investment and capital raising conference and exhibition, bringing together over 3,000 investors, financiers, brokers and mining developers will be held in London from 30 November to 4 December 2016. Traditionally, on 29 November MINEX will hold its own conference on the Eurasian mining updates. MINEX Forum is pleased to endorse events organised by its international partners in the UK, Canada and China. Please contact MINEX Forum events team for more details about availability of special delegate rates, speaker, and sponsorship and exhibitor opportunities available at these events. The 4th MINEX Eurasia Mining conference took place on 30 November 2015. The conference, kindly hosted by Bryan Cave international Law Firm, addressed key developments and present deal making opportunities across the mining industries in Russia and Central Asia. will be held in Vienna on 17-18 November 2015. Over the last decade MINEX Forum provided vibrant platform for industry-wide exchange of innovative technologies and investment in mining and exploration in Eurasia. We are planning to launch MINEX Europe Forum – the annual event showcasing European mining industry’s developments, promoting technological advancements and investment opportunities. If you are interested in supporting MINEX Europe initiative, we will be happy to hear your views and proposals. Under Russia’s chairmanship of Shanghai Cooperation Organisation in 2015, trade, investment and technical cooperation between China and Eurasian Economic Union will be growing and new opportunities for mining and exploration will be emerging. MINEX Forum will be taking part in China Mining for the 4th time (since 2008) and will be organising meetings and presenting Eurasian (Russia + Central Asia) mining projects at China Mining – Asia’s largest mining trade and investment show. will be held in Moscow on 6-8 October 2015. Russia’s mining industry is fully integrated into the production of metals and raw materials and plays significant role in the global economic development. Many argue that with the recent rouble devaluation, discounted assets and the fact that political risk does not affect the industry as much as other sectors, it is a good time to invest in mining in Russia. MINEX Russia Mining and Exploration Forum, held in Moscow since 2005, is regarded as one of the most successful business-driven mining events in Russia. On 9 June 2015, PwC Russia’s Moscow office hosted to a seminar on “Global trends in mining. Deoffshorisation and tax amnesty in Russia” topic. Russia’s top mining and metals companies were well represented among the attendees. Stay up-to-date with the latest news from Minex: Leading Russian & CIS Mining Trade Forum and Expo. 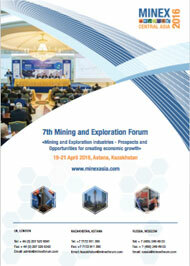 MINEX: Russian Mining Trade Forum and Expo. Copyright © 2005-2019 Advantix Ltd.